← Has anyone heard of Prosper Mérimée (1803- 1870) or André Malraux (1901-1976)? Well I for one owe them a deep sense of gratitude. 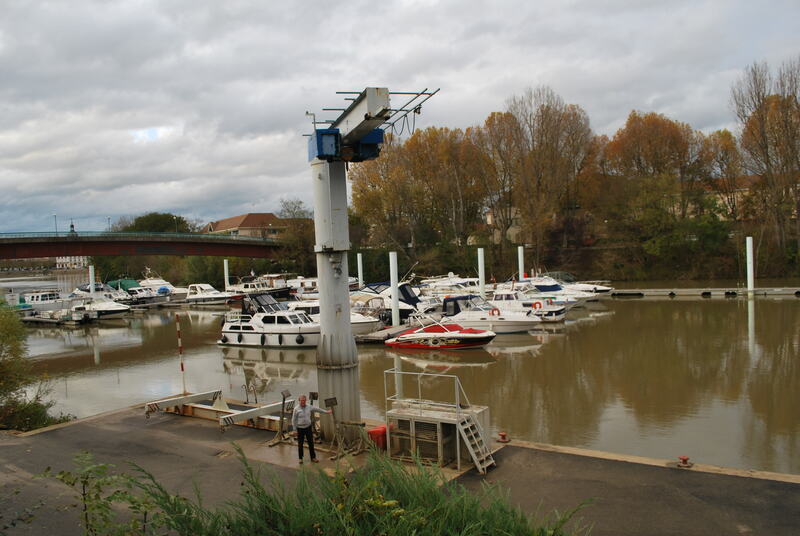 When we arrived in Chalon many people told us that in winter the Saone floods, the water levels rise dramatically and there can be a problem with large tree branches being washed down river into the boats. We thought “people being dramatic again” but this time they were right. In the three days we were away, it apparently rained nonstop and water levels rose two meters in 24 hours. Being from Ireland, we are not used to this type of rapid water level increase (remember two meters is the height of the average person)! I have included photos that we took before levels rose and after so you can see the difference. While there was some flooding in the area around Chalon, it did not really affect the city as it is well set up for this kind of change in water levels (I had previously wondered why the town quay walls were so high now I know). The flow in the river was fierce (same as we saw on the Rhine River) and water rushed past the boat on its moorings. All the boat mooring ropes were guitar string tight, they squeaked and groaned all day long until the water subsided. We were safe as the pontoon float, and rise and fall with the water level. Nuala loves dramatic weather and was in her element. 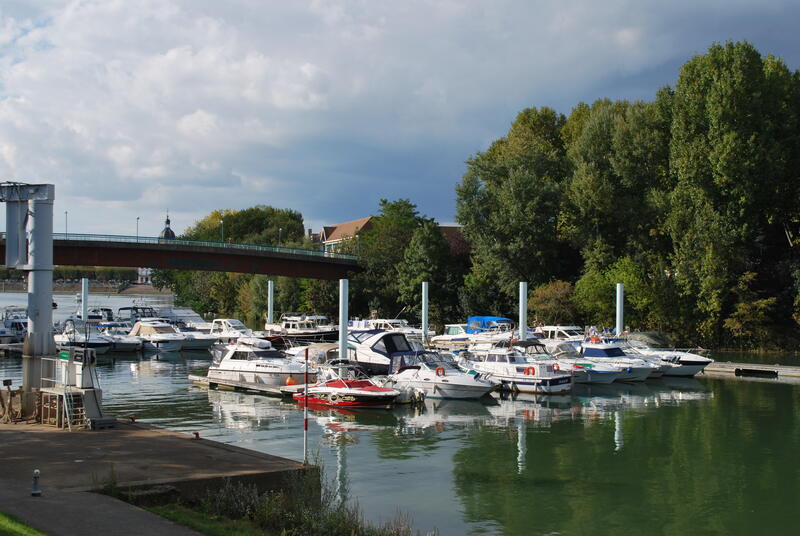 Two Swiss cruise ships were caught between the two main bridges in Chalon for three days. The water level was obviously too high to allow them to pass under either bridge. Yesterday the water subsided overnight, as fast as it had risen the previous week and the Saone has slowed down again. I wonder what the rest of the winter will bring. Exciting times ahead! Nuala points to where the pontoon rose to. Its the same height as her! This entry was posted in C'est La Vie - The Boat, On the Journey, Places visited and tagged flooding in Chalons, saone river, Saone River floods, Sarlat. Bookmark the permalink. 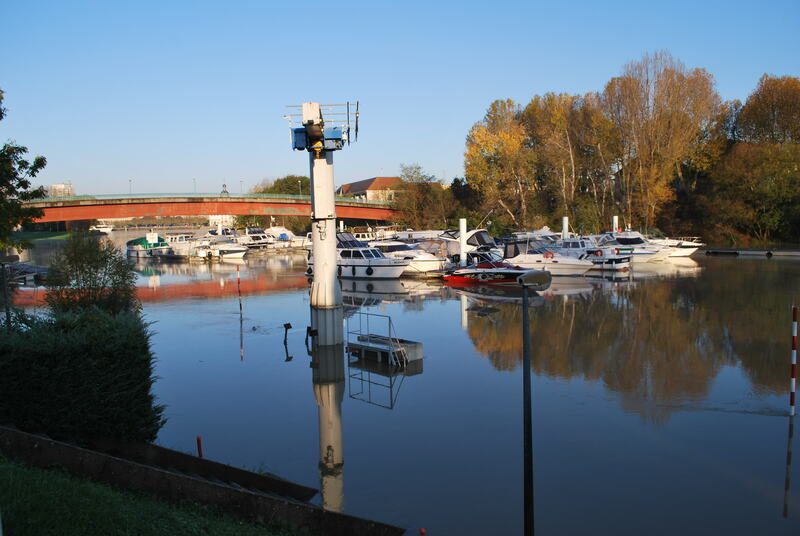 4 Responses to River Saone in Flood- Water rises two meters! Hi guys- yesterday I visited a friend whose daughter is now living in France with her boyfriend – a professional rugby player from the UK but now playing in France. My friend was talking about their recent visit to the area where her daughter lives – guess what? they live in Chalon sur Saone!! Sarah is her name & she runs an online vintage clothing company ‘Vintage Magpies’ from France – buying in local flea markets & selling on. So look out for a young English couple – I told her mum to tell them to look out for your irish flag! good to hear from you. Yes small world. We will look out for them. What are their names?